The battlefield near Verdun, the Meuse River (Maas), and the Argonne Forest, viewed from the German line looking southwest. During the 1916 Seige of Verdun, the road and a light rail line from Bar-le-Duc were the sole source of supply for the besieged city. Labels: Argonnen (Argonne Forest), Verdun, Maas (Meuse River), Bar-le-Duc. Die Argonnen. Von Verdun bis Reims. 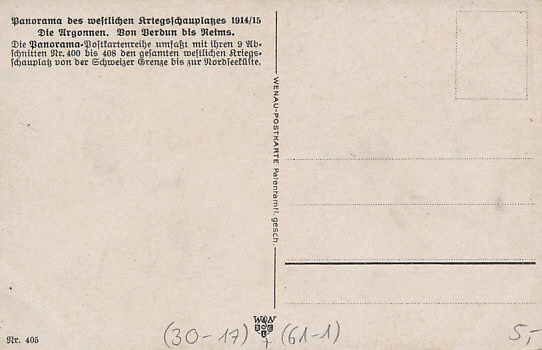 Die Panorama-Postkartenreihe umfaßt mit ihren 9 Abschnitten Nr. 400 bis 408 den gesamten westlichen Kriegschauplatz von der Schweizer Grenze bis zur Nordseeküste. 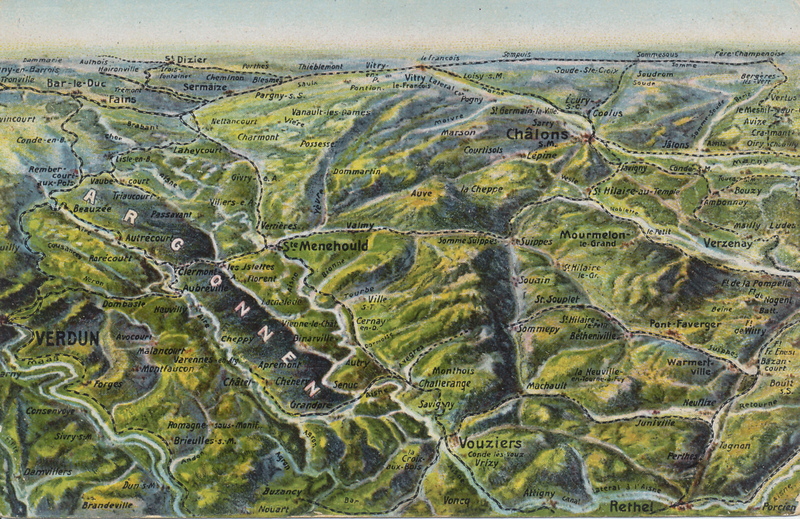 Panorama of the Western theater of war 1914/15 from Compiègne to Arras. 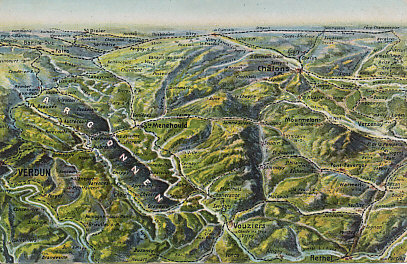 The panoramic postcard series includes with their 9 sections No. 400 to 408 the entire western front from the Swiss border to the North Sea coast. The Argonne lies between the Meuse and the Aire Rivers west of Verdun. General John J. Pershing activated the United States First Army of the American Expeditionary Force on August 10, 1918. It took over the St. Mihiel sector with responsibility for the front from the Moselle River to the Argonne Forest. In the Franco-American Meuse-Argonne Offensive, the Americans advanced through the Argonne Forest and the French advanced to their left. The Argonne is a region in France. To Conquer Hell: The Meuse-Argonne, 1918 Lengel Edward G.